Dr. Patrick Cohn shares his performance-boosting mental game strategies in his unique CD and Workbook series. Perfect for any athlete, coach, performer or sports parent! 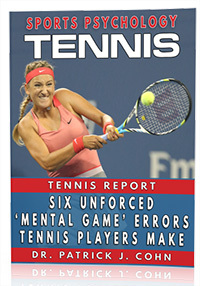 Learn cutting-edge mental strategies to improve your performance on the court. 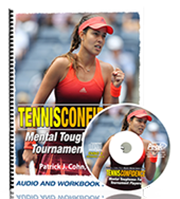 Learn how to mentally prepare for tournament play with Tennis Confidence: Mental Toughness for Tournament Play! 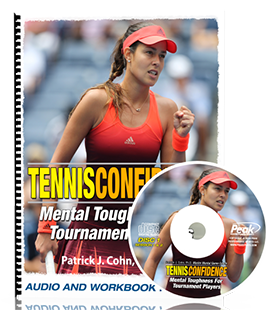 Tennis Confidence is a complete mental training program developed Dr. Cohn. You learn the same strategies Dr. Cohn teaches his personal students to help them improve mental toughness and consistency – from managing unrealistic expectations to coping with perfectionism. 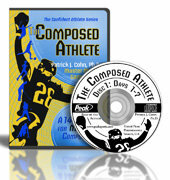 “The Relaxed Athlete,” one of our CD programs in the confident athlete series teaches you Dr. Cohn’s top mental strategies for complete mental preparation for competition. Two programs combined into one, you not only learn how to develop a focused and confident pre-competition routine, but you also learn the secrets to a poised and relaxed mindset. The program includes 14 days of mental preparation exercises that can be tailored to your specific sport. Each copy comes with 3 premium bonuses that you can download immediately! 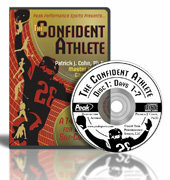 “The Confident Athlete” is a ground-breaking system to teach you how to think like a champion and have ultimate self-confidence every time you step on the playing field, court, track, or course. This Program consists of 2 audio CD’s that include 14 days of confidence fueling exercises and a simple to follow workbook that guides you, helps you apply the strategies, and customizes the exercises to your personal needs. 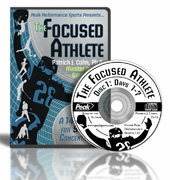 “The Focused Athlete” teaches you a system to get the “Tiger Stare.” This CD Program includes 14 days of concentration-boosting exercises and a simple-to-follow 63-page workbook that guides you through each of the 14 days, helps you apply the strategies, and customizes the exercises to your personal challenges and needs. Dr. Cohn gives you ALL HIS Focusing STRATEGIES in this 14-day step-by-step easy-to-apply mental training program! 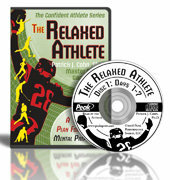 “The Composed Athlete” is perfect for any athlete, coach, or parent who wants to learn or teach athletes how to stay cool, calm, and collected during crunch-time, The Composed Athlete is a step-by-step system for gaining maximum emotional control and performing well especially under pressure. Dr. Cohn shares teaches you his comprehensive system to uncover the key mental breakdowns that hold athletes back from maintaining composure. Learn how to develop a mindset so you can thrive even under extreme pressure with The Composed Athlete. Comes with two premium bonuses (value $50) you can downloaded immediately! “The Fearless Athlete” is in The Confident Athlete Workbook series. This CD/Workbook program is a ground-breaking program to help you overcome the mental handcuffs of perfectionism, fear of failure, and learn to perform with unbeatable trust. Dr. Cohn delivers his new program in a step-by-step practical workbook you use for just 15 minutes a day! Dr. Cohn gives you ALL TRUST-BOOSTING STRATEGIES in this 14-day step-by-step easy-to-apply mental training program! Get 30% off retail as a Peaksports member! Become a member now!